They DO look like a school of fish....and irresistably delicious too! Ha! I can totally get into color themed food. And green is my favorite so this is an awesome dish as far as I'm concerned :) Sounds AND looks delicious! That sounds so healthy and delicious. So yummy! I just adore arugula...I discovered my love for the green only a few months ago. This looks so delicious! Thanks for making me smile tonight (you always do), and I hope you are having a week full of love and joy. Hugs and love. My arugula has gone crazy this summer (yay) and I am definitely doing this. 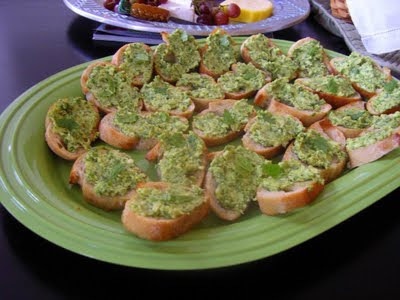 Love the idea of a little peppery pesto! (And all that green... swimming in a pool). What an unusual pesto, Rosemary. Sounds fantastic. I have tons of arugula in the garden so something other than salad would be a great use for this robust leaf. Making these! Have a great weekend. 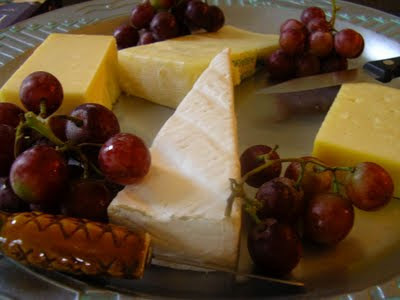 Gosh, those do look gorgeous on your green platter! YUM! I love your sister's monochromatic styling...the mint green platter goes so well with the arugula-edamane topping. The crostini sounds delicious, and looks lovely to boot! I love this healthy appetizer! So colorful! No rain dance around here. In fact, I'd be happy to try and blow some your way. I have edamame in the freezer just waiting to perform at a meal. Paired with arugula sounds very agreeable to me. Love the jade green coloured spread! Very pretty and appetizing. 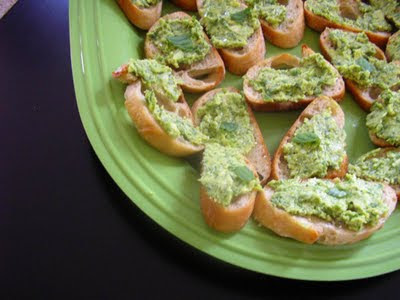 The crostini look great with that lovely green color. I might try the recipe using peas. I really like the looks of the green on green. A striking photo. I can't find fava beans either. It's nice to know what to substitute.